Today, more than one company is engaged in digital identification, and not two companies that once began as young start-ups. Most of them have the capitalization of the average bank, and this despite the active growth of the market. One of the companies in the digital identity sector is Trulioo, founded in 2011 in Vancouver. The depth of verification in services is provided by using databases of both special services (for example, the FBI) and information obtained from open sources: user purchase history, viewing history, and so on. Company managers claim that their solutions identify more than 4 billion people around the world. Similar projects can boast of American project Idology, where they use a patented algorithm to verify the identity of a user based on recent user behaviour, generating situational questions about cases that have happened to the user himself. For example, to confirm a transaction in the bank, you can hear the question about how much you withdraw at the particular ATM a few days ago. In KYCBench it is worth mentioning the following trends in the development of technologies, such as the use of biometrics and machine learning technologies and especially new way of the digital data transferring - the sensational blockchain. The solution seemed obvious from the moment the technology began to be popularized: recording user identification parameters into blocks eliminates any attempt to fake a digital person. KYC Bench provides AML checks is all possible and mostly updated database, covering more than 200 countries and 28 languages. 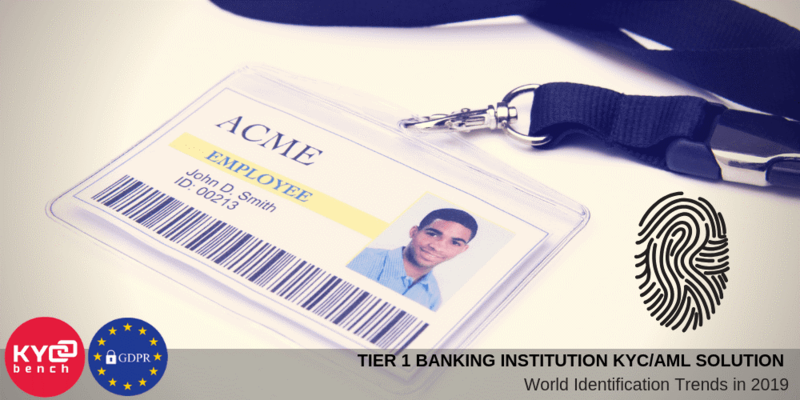 By mid-2017, the identification market was estimated at $ 10 billion. But, according to industry experts, even this does not reflect the full potential, and in the near future we should expect the emergence of new players and an increase in the number of digital identification implementations in the business. The subsequent development of technologies in the field of user identification is dictated by both the needs of the market and regulators (for example, the emergence of demand for mandatory multifactor authentication from mid-2018 and the popularization of measures to introduce unilateral, personalized sanctions by a number of states) and the evolutionary development of technology - big data and biometric recognition sensors.